Wrong ideas have contributed to the development of science in very significant ways. Take, for instance, the cyclol hypothesis. Dorothy Wrinch, a mathematician by training, has been the main proponent of this idea and advanced it rather ferociously. The book “I Died for Beauty” is a fascinating read. The centerpiece of Wrinch’s theory posits that protein folding results from covalent collapse of amides to generate cyclol-dominated structures. Below you can see a protein that has “folded” by way of cyclol formation (now all amide carbons are in their sp3 state). 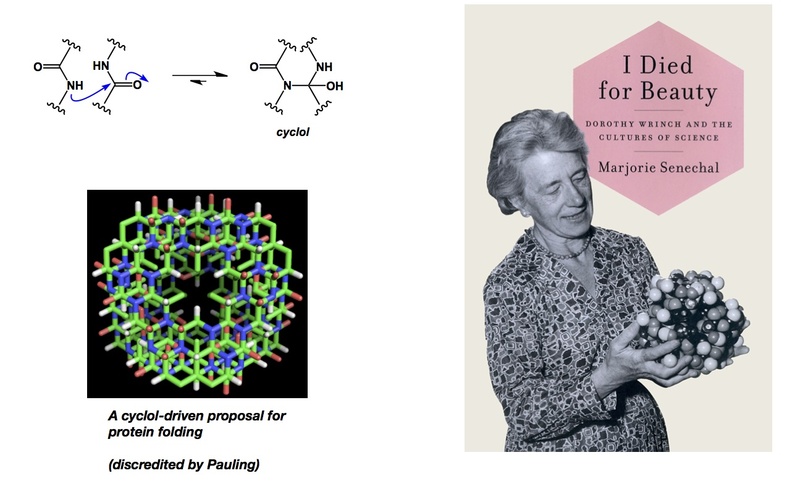 By the way, Dorothy Wrinch was a mathematician, which goes to show that one might want to be skeptical about a mathematiciain’s hypotheses related to chemical bonding, no matter how celebrated that person is. Indeed, any undergraduate chemistry student with knowledge of amino acid side chains should be able to run a “gedanken” (or “thought”) experiment and convince him/herself that it is not feasible to pack amino acid side chains according to the cyclol view of the world. But the theory had persisted until it was eventually discredited by Linus Pauling. While the cyclol idea was shown to be fundamentally wrong, its rejection had an enormous contribution to the discovery of hydrophobic effect. You can read about this in an excellent historical overview (see the link below). Here is another twist: think about the green fluorescent protein (GFP). Maturation of its chromophore is due to a complicated cascade reaction that starts off a cyclol structure. Take a look below at how this happens. While here there are no multiple cyclol units similar to Wrinch’s folding idea, it is interesting that a significant protein (GFP) owes its function to a structure that has been forged through a covalent bond between two nearby amides. I think we should always remember Dorothy Wrinch! Hmm, I don’t buy the cyclol mechanism of the GFP chromphore maturation. I think it is more likely that the Tyr residue oxidation happens first, and the produced the quinomethide tautomerizes to acylamido cinnamoyl residue where things rest for awhile. Then you have a second oxidation event, of phenol to a quinomethide, with C=C bond shift to acylimine-quinomethide, which now has a pretty darn good electrophilic carbonyl (vinylogous diacyl N), and a rigid conjugated system which is practically smashing CO into that NH, and at that step the cyclization-dehydratation happens. after drawing the proposed scheme for myself, I would like to take back my previous comment. 1) As there is only one oxidation [-2H] event 2) and it is probably not enzymatic (dehydrogenase etc) because it happens inside the “protective barrel” where the Tyr sidechain is little hard to reach. So I think it is a micro-environment that makes the cyclol formation and phenol OH deprotonation possible, and even then, it is a relatively slow process. 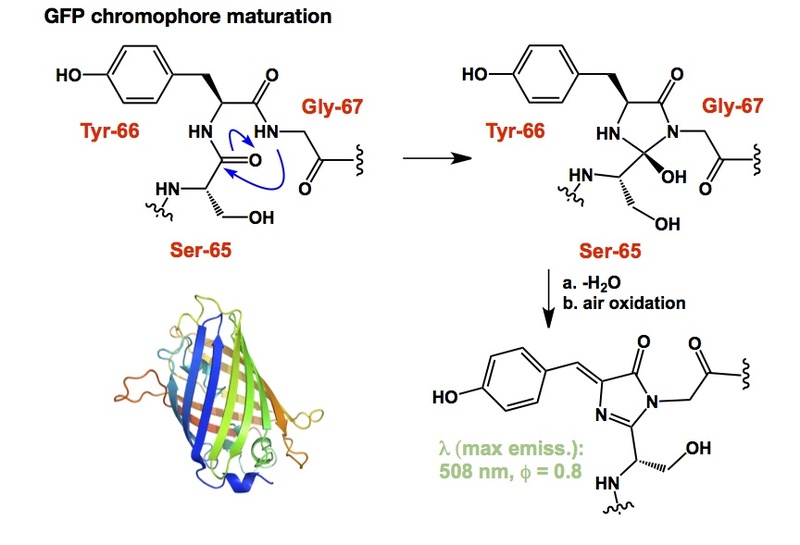 The fact that chromophor maturation is temperature – dependent (and gets disrupted above 20C, unless mutants are used) is a good indication for the tertiary structure-enabled microenviroment being a special player in the chromophore formation.